Get that mortgage monkey off your back! Want to know how to build wealth smartly? We’ve got just the tip for you! Here are some great tips for achieving your financial goals in 2019! Here are some great tips for giving thanks and how to be grateful for each and every day! Where do you gather when you visit with friends in family? The kitchen of course! Here are some tips about upgrading and functionality of one of the most used rooms in your home. Retiring well so you can live a happy lifestyle requires a little work. The September Tip will guide you how to plan well and collect the savings you need for retirement. We all have it. We all want to get rid of it. DEBT. Here are some benefits to working to on making that debt disappear! Thinking about renovating? Don’t know who to call? We’re here to help with our June Tip! Maintaining your home’s curb appeal has never been more important than now because many homebuyers begin their home search online. After all, once potential buyers see a home they like online, they’re more likely to schedule a showing or drive by the property to see the home in person. This month, I’m sending information intended to help you improve your home’s curb appeal, including eight tips designed to make the home’s exterior and landscape appear more attractive to potential buyers. Not thinking of selling right now? These tips will also help you maintain your biggest investment—your home—and make it the pride of your neighborhood, until the day you decide to list. If you’re thinking of listing your home this spring, give me a call! Even if you’re not thinking of listing now, I can offer tips to help you improve your home’s value and connect you with reputable service professionals in my network who can help. I'm a Writer. A Producer. A Digital and Print Marketer. A Dame of All Trades. Albert Einstein once said, “The hardest thing in the world to understand is income tax.” Luckily, tax preparers and DIY tax software take much of the mystery out of the process. Whether you prepare your taxes yourself or send them to a professional, it’s still important to collect and sort your information, including any changes in status or economics that occurred during the year. The information I’m sending this month is intended to prepare you for tax time. Page one provides a list of financial details you may need to gather ahead of time to make the process easier, as well as some tips to help you get your refund faster. Page two outlines steps to take to help you protect your identity from thieves who wish to gain access to your information. Tax season doesn’t have to be stressful. With a bit of preparation, the process becomes a breeze. How Do You Secure Your Information Following Theft? As more people rely on the internet to shop, bank, file taxes and more, thieves are finding more ways to steal personal information. While many people take the necessary precautions to keep their details safe, thieves may still be able to attain personal information by hacking into the systems of larger businesses. How can you make sure you’re secure and what steps can you take if your information is stolen? This month, I’m digging deeper into the topic of identity theft, specifically discussing the rise of data breaches. Sometimes, despite your best efforts to protect your identity, you may still be compromised—as the 143 million people impacted by the EquiFax data breach learned. 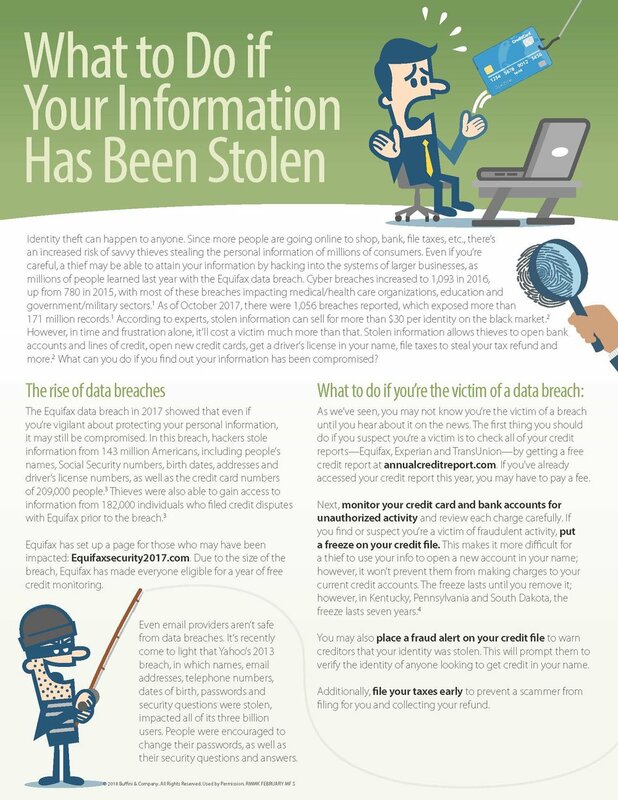 Page one outlines what to do if you learn you’re the victim of a data breach, from monitoring your credit reports and accounts to placing fraud alerts and freezes on your credit file to prevent thieves from using what was stolen. Page two outlines the specific steps to take if your banking and credit card information or driver’s license information has been stolen. Although the thought of a thief having access to your online identity is frightening, this piece is intended to empower you to take control should you ever find yourself in the position where your information has been compromised. It's here. The Winter! We all want to save money and prevent damage caused by the Winter months. Here are some very easy and cost effective things from Mid-Atlantic Home Improvement that you can do to help your home in the coming cold months. With the cold-weather months settling in, homeowners are looking for ways to shut out the elements to maintain optimal indoor comfort and energy efficiency. Performing some relatively simple improvements and winterizing tasks before ice and snow settle in can save you a lot of money, hassle and headache during the winter season. Clear eaves and gutters of autumn leaves and debris. Making sure that water can flow freely through your gutters now will help prevent icicles and ice dams from forming later. Turn off the water supply to all faucets and fixtures that service exterior locations. Locate and seal off any cracks or gapsin your home’s shell with caulking, especially around window frames. Cold air seeping in and warm inside air leaking out accounts for major energy waste – simple leaks can sap home energy efficiency by 5% to 30% a year. Seal up gaps with caulking and weatherstripping especially around doors and entry points. Cover drafty windows and patio or deck doorways with an insulating layer of clear plastic, or better yet replace older windows with energy-efficient one, if you can. Fix any roofing problems like aging or missing shingles. Repairing minor defects before winter arrives can help prevent larger and more costly problems heading into spring. Get your chimney inspected & cleaned – a chimney sweep can check the structure of your flue and remove any combustibles or obstructions in your chimney. Seal off drafty doors with rubber strips, or install new storm doors to help energy efficiency. Replace filters monthly during heating season – dirty filters restrict airflow and increase energy demand. Replacing them regularly will improve your furnace’s efficiency and longevity saving your money along the way. Change your ceiling fan direction. Counterclockwise rotation produces cooling breezes and clockwise rotation produces warmer air. Changing the direction of your ceiling fans will circulate the air pooled near the ceiling back down – cutting your heating costs as much as 10%. Wrap water heaters and exposed indoor pipes that transport hot water with insulation to help prevent any energy loss. Upgrade insulation in key areas, including attics, basement ceiling, exterior walls and around electrical sockets; this can help reduce your heating costs by keeping a more warm air inside the home and inhibiting thermal transfer. Install a programmable thermostat to create an optimized, automated heating schedule that keeps your home warm when people are home and saves energy when the house is vacant. And remember, for every degree you lower the thermostat during the heating season, you’ll save between 1 and 3% of your heating bill. Seal the ducts – in an average system, 10% to 30% of heated air escapes from ducts. Have a professional test and fix any duct issues – you’ll pay once and save for years to come. Have a licensed technician perform a check of your furnace to make sure it’s operating as efficiently and safely as possible and is equal to the challenge of keeping your home warm all winter. Why invest in a professional tune-up? Keeping your furnace clean, lubricated and properly adjusted will reduce energy use, saving up to 5% of heating costs. Above are some of the most effective ways to save money by winterizing your home the smart way – if you looking for an additional challenge, here’s 50 more ways to save. These low-cost, high-reward strategies help reduce energy inefficiencies while supporting improved indoor comfort all winter long, all while guarding against potentially costly mishaps. Use them to ward off the cold, reduce your risks and maintain the overall integrity of your home. The holidays are a special time of year to spend with friends and loved ones. Holidays are also the busiest travel times, which can make getting to your destination stressful. However, there are things you can do to make it easier. The information I’m sending this month is intended to take the stress out of traveling during this season. Whether your trip is already planned or you’re searching for last-minute deals, this piece offers tips to help you reduce the stress of flying or driving. Additionally, I share important advice on how to stay healthy and how to ease traveling with small children or pets. Don’t let the stress of traveling dim your holiday spirit; follow these tips and you’ll arrive at your destination happy, healthy and ready to celebrate with your loved ones. Oh, by the way®… if you know of someone who would appreciate the level of service I provide, please call me with their name and business number. I’ll be happy to follow up and take great care of them. It’s almost time to celebrate the spirit of the season with parties and get-togethers to reconnect with our families and friends, especially those who live far away. The information I’m posting this month will help you throw the perfect holiday party without breaking the bank. You’ll find several tips to help make the planning process fun, stress-free and budget friendly, from prioritizing where you’d like to spend most of your dollars to ordering food and coordinating entertainment your guests will love. Whether you’ve been planning your holiday party for months or you’ve just decided to throw one, you’ll find this information valuable. I want to take a minute to thank you for your business. Your business and referrals drive my business and make it successful. Happy Thanksgiving to you and your family. We aren't just about buying and selling, we think about all things HOME. Are you or someone you know thinking of buying a home this year? If you’re a first-time buyer or if it’s been a few years since you’ve purchased a home, you may wonder what to expect during the homebuying process. This month, the information I’m sending will give you the scoop on what to expect at every major step of the way, from home search to closing. The piece is intended to help you understand the process, think about what you want in a home, prepare for financing and answer some of the questions you may have. While every transaction is different, the steps outlined are typical in most transactions. If you or someone you know is ready to buy, give us a call! We’ll be happy to walk you through the process and help you find the right home for your needs. There are many factors that go into selling your home. Maybe this is the first time you are doing so and you want great care and guidance in selling it effectively and quickly. Here are some tips that may help! Are you thinking of listing your home? For many people, especially first-time sellers, the selling process may seem intimidating because they’re not sure what to expect. A sure way to ease any anxiety you may feel is to learn more about the process. This month, the information I’m sending provides an outline of what to expect during the selling process. From getting your home ready for its market debut to handling offers and the closing process, this piece helps you understand what may happen and offers tips to get your home ready. While the specifics of your sale may be different, the steps listed consistently occur in the majority of transactions. When you’re ready to list your home, we’ll be there every step of the way to explain the process. Give us a call today! Do you feel your credit score needs improvement? Whether you’re getting ready to make a large purchase or striving to achieve a perfect score, one thing is clear: there’s no time like the present to improve your credit. This month, we're showing you five tips to help you improve your credit score. From reviewing your credit history and addressing inaccurate or incomplete information to paying down debts and keeping a budget, these tips are sure to help you repair negative history and boost your future credit. With effort, time and patience, you’ll be well on your way to great credit. Share this information with your family and friends who would like to improve their credit scores. Also, if you’re thinking of buying or selling a home, give us a call. Click photos for enlarged image. As neighborhoods are abuzz this season with new residents moving in and some goodbyes for neighbors moving out, here are some great tips for how they can make moving a lot easier! Moving is stressful. Thankfully, with proper planning, you can ease the transition for your entire family. The more prepared you are, the easier the move will be. Plus, you’ll feel more confident when handling unexpected challenges. This month, I’m sending information intended to reduce the stress of your next move. Page one outlines three tips to help your move go more smoothly. Moving is tough enough, but with the addition of children and pets, stress may increase exponentially. For those moving with little ones and furry friends in tow, page two offers insight to help keep every member of your family happy. Not moving in the near future? Share this information with your family and friends who are moving to help them make it less stressful. If you’re thinking of buying or selling, give me a call. The Sean Priest team is an elite team of licensed realtors in Richmond, VA at Hometown Realty. Sean Priest, Melvin Jones, and Jo Ann Breaux specialize in selling, buying, marketing and negotiating home sales in RVA. We are here to help and guide you through the home buying and the home selling process. The Sean Priest Team is a group of agents from Hometown Realty and is not an independent realtor company. Disclaimer: The information contained in these listings is deemed reliable but is not guaranteed. These real estate listings were derived from the Central Virginia Regional Multiple Listing Services, LLC, of which this brokerage is an independently owned member. All properties are subject to prior sale, change or withdrawal. These listings are refreshed within a minimum of every seven calendar days. Thus, listings may appear here for properties no longer on the market. The information provided is for consumers' personal, non-commercial use and may not be used for any purpose other than to identify prospective properties for purchasing. All information is deemed reliable but is not guaranteed accurate. The multiple listing information is provided by Central Virginia Regional Multiple Listing Service, LLC, from a copyrighted compilation of listings. The compilation of listings and each individual listing are � 2007 Central Virginia Regional Multiple Listing Service, LLC. All rights reserved. Neither listing broker(s) or information provider(s) shall be responsible for any typographical errors, misinformation, misprints and shall be held totally harmless. ©2019 - All Rights Reserved. Hometown Realty.